Here’s the story of how a once promising young banker used his Auburn finance degree to create a pop culture phenomenon and win three Emmys and counting, exactly as planned. It starts in Jordan-Hare Stadium. It was 1992, Pat Dye’s last year at the helm. Wins were scarce. Sanctions loomed. But Oct. 31 was still a football Saturday in Auburn. That’s all it took. Crabbe grew up in Virginia. Family trips to Alabama—mom and dad both grew up in Birmingham—had him convinced he’d like to spend college in the Deep South…as long as it wasn’t at Crabbe U. He thought he’d decided on Emory. He had a healthy appetite for pop culture; Atlanta would be a buffet. Then he went for a visit. Turns out the city that was about to have the busiest airport in the world didn’t exactly have the southern charm he’d imagined. Final score: Auburn 24-Arkansas 24—a tie, sure, but an exciting tie. 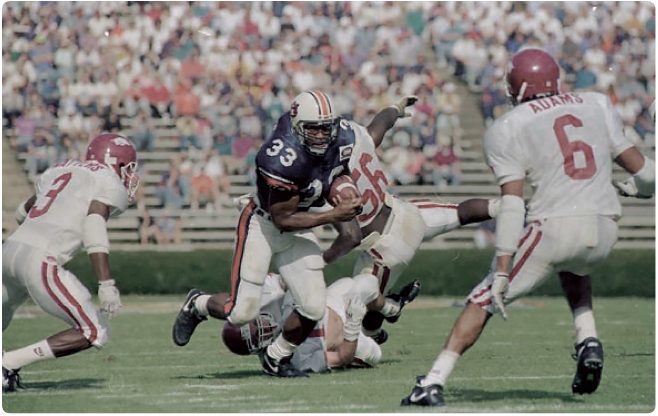 James Bostic ran for 211 yards, the best single-game performance from an Auburn running back since the days of Bo Jackson. Adding to the magic? Bo was actually there; they retired his jersey at halftime. He packed his bags for the Plains, pledged FIJI, and suited up for Auburn’s club lacrosse team. During the day it was class, studying, and “Law and Order” reruns. On Thursday night, it was “Friends,” “Seinfeld,” and “E.R.” Friday nights meant frat parties. In 1997, he graduated with a degree in finance. Not media studies, not theater—finance. The rest is late night history. IT WASN’T JUST BECAUSE he had to pick something. It wasn’t just a Plan B. Sure, he knew it was something he could fall back on. But from the moment he stepped into Lowder with the latest issue of Entertainment Weekly or Premiere or Movieline in his backpack, Crabbe was convinced a finance degree would actually be the secret to his success, not in stocks—in show business. He still jumped through the business school hoops. Summer internships at NASDAQ. All that stuff. On paper, he was headed straight to Wall Street. Instead, the promising young banker cranked up the Notorious B.I.G., turned left, and followed his dream. The company he’d interned for thought they had the wrong number. Calling it a “Jack Kerouac thing” wasn’t that far off. He was 22, on the road to Los Angeles, with no contacts, no prospects, no bed. He finally found a floor to crash on while he looked for a job. Thankfully, the three women in charge of what in 1997 NBC was calling “electronic publicity” liked how he talked. It wasn’t exactly a dream job. But in the Must See TV days, just sweeping NBC’s floors would have seemed like the bigtime. For a while, the only number-crunching Crabbe did was at the craft services tables on set, counting how many M&M’s he could eat. Then, about two years later, it happened. The line producer for CBS’ “Late, Late Show with Craig Kilborn” needed an assistant. Line producers handle budgets. Where’d you go to school? What was your major? AFTER THREE YEARS OF TRYING to scratch the itch, Crabbe finally reached it. A year into assisting Kilborn’s line producer, he was hired internally to be one of the “Late, Late Show” researchers, which meant coming in at 7 a.m. to do something he’d mastered in college—pour over entertainment industry magazines. And that meant a chance, however small, for creative contributions. If Crabbe saw something interesting in Variety or Hollywood Reporter, he’d run it up the “Late, Late” flagpole. Maybe it’d make it on the show. If he had been, things probably would have been fine. Because, according to Variety, Carson Daly was hiring. Crabbe loved the music side of things, so “Last Call with Carson Daly” sounded almost too good to be true. He applied and got it—a job with “producer” in the title. He was an associate producer not just on a late-night show built around music, but one he’d actually help create from scratch. Thanks to his work with Daly, he eventually landed a freelance writing gig for MTV competitor Fuse, which turned into Supervising Producer of Music Programming. He was back to doing live studio shows. Things were good again. In 2009, when Jimmy Fallon got the nod to take over NBC’s ‘Late Night,’ they got a lot better. “I knew Jimmy socially from when I was doing ‘Last Call’ because we shared an office with ‘SNL,’” Crabbe says. He’d also become good friends with Michael Shoemaker, at the time an ‘SNL’ producer second only to Lorne Michaels. Which meant Crabbe could be segment producer, helping create another show from scratch. In late night, that’s pretty rare. For Crabbe, it had now happened twice. In 2014, it happened again. A year earlier, Crabbe and Co. transitioned Fallon’s surprisingly successful ‘Late Night’ format to late night’s Mount Olympus. He got bumped from segment producer to supervising producer, earned some Emmy nominations, and helped turn “The Tonight Show” into a ratings juggernaut among 18- to 49-year-olds. Professionally, he was almost on top of the world. 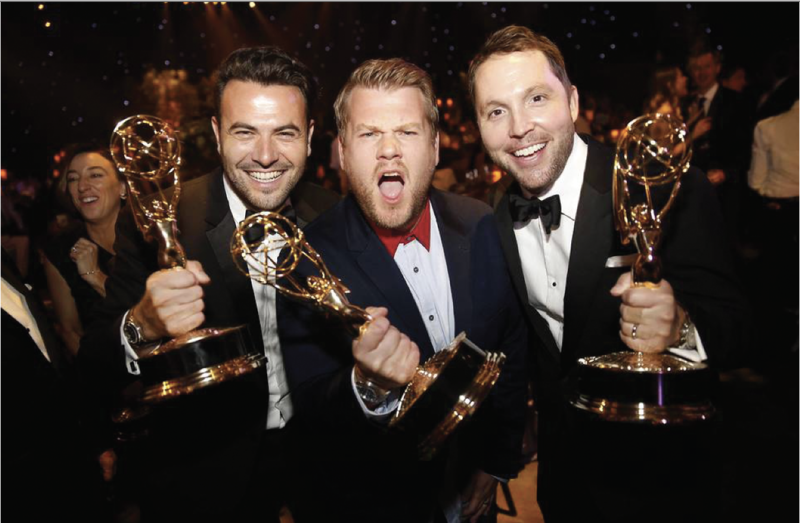 Then some immensely talented guy he’d never heard of named James Corden came calling with an opportunity to create a show that, even if it was back in L.A.—even if it meant leaving “The Tonight Show”—he couldn’t pass up. Robbe Crabbe has entertained you and probably half the people you know. DO YOU GO ON THE INTERNET? Have you clicked on one of those videos of Adele or Justin Bieber or Miley Cyrus singing along to their own songs on the radio while that British dude drives them around? If so, Rob Crabbe has entertained you, and probably half the people you know. Carpool Karaoke is by far the most popular bit on the increasingly popular “Late, Late Show with James Corden,” thanks, in part, to the show’s former line producer’s assistant turned researcher turned—15 years later—Executive Producer Rob Crabbe. The simple concept entered the cultural lexicon almost immediately after the show premiered in March 2015. Every video goes viral. In just over a year, “The Late, Late Show’s” YouTube channel topped a billion views; now it’s pushing 4 billion. In addition to spawning a 16-episode series available to Apple Music subscribers, Carpool Karaoke got its own CBS primetime special in 2016 and another in 2017. 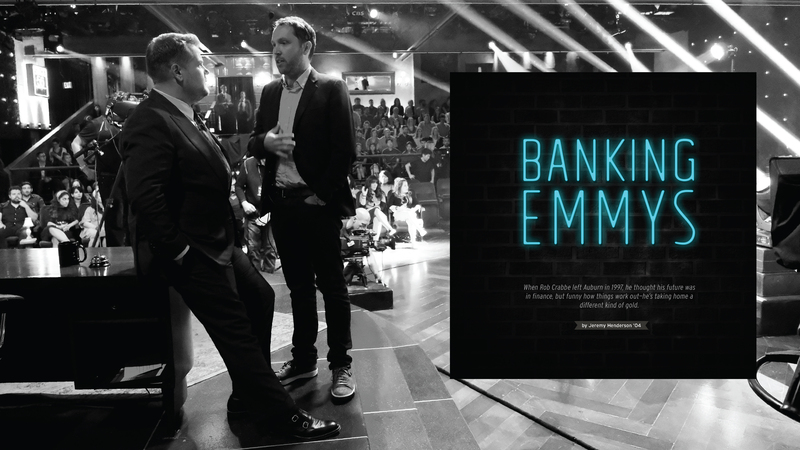 Rob Crabbe, former promising young banker, won an Emmy for both of them. He also got an Emmy for the “Late, Late Show” winning Outstanding Interactive Program in its very first year. He keeps those at home. He keeps the Critics Choice Award for Best Talk Show and the Producer of the Year Award from the Producer’s Guild (from his ‘Tonight Show’ days) in his office, which is about 12 feet away from where he started his first job in late night, helping the man who handled the budgets. Now he’s the man who handles the budgets. He handles everything. Thank you Raymond J. Harbert College of Business. It keeps him busy, but don’t worry. “I have all my Auburn alerts set on my phone,” he says. He has Auburn hats. 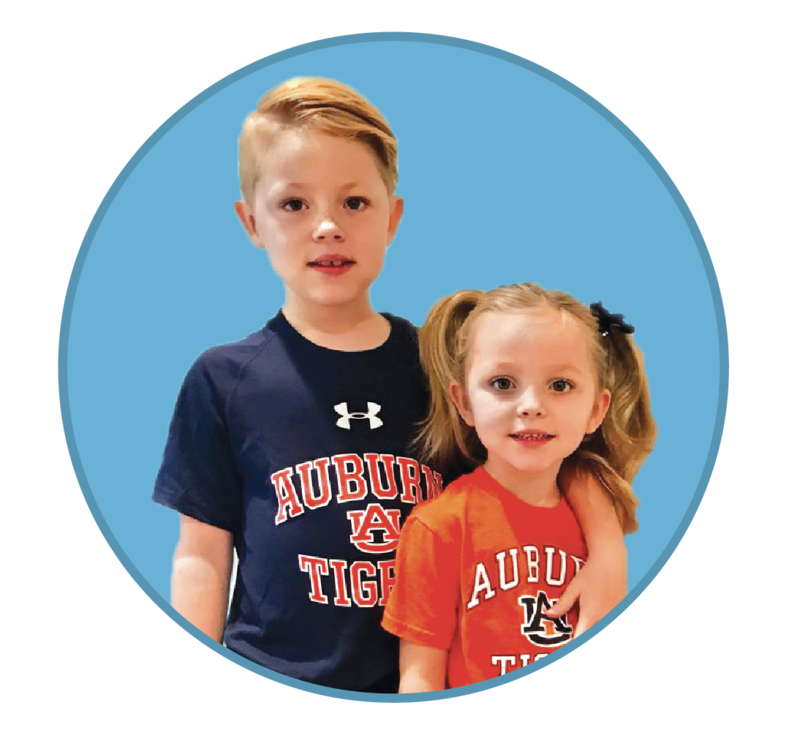 His two kids (pictured below)—seven-year-old Henry, and five-year-old Lila—have Auburn clothes. His grill has an Auburn cover. He did not, however, watch Auburn’s 52-20 win over Arkansas in October, almost 25 years to the day after the Auburn-Arkansas game that made his college decision for him. He couldn’t. He was flying home from vacationing in Vienna. Not exactly a Jack Kerouac thing. “You should call that NASDAQ guy back and ask him to invest some of your money,” I tell him. He laughs.